Made possible in part by Maryland Relay and the SunTrust Foundation, the MPT Salutes Vietnam Veterans Traveling Exhibit continues to make its way around Maryland through September 2017 to celebrate the military service of Marylanders during the Vietnam War. This compelling exhibit has already visited dozens of locations throughout Maryland and the District of Columbia. Take a look at the schedule below to see where the MPT Salutes Vietnam Veterans Traveling Exhibit will be next. The exhibit features both current-day and wartime images of 16 men and women along with their recollections of incidents from the war. Also included is an opportunity for children to color pages to thank veterans as well as stationery for visitors to craft messages to veterans or share their own stories. 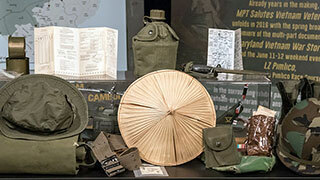 Various locations in conjunction with Ken Burns Vietnam screenings - check back for more details. The exhibit will be tourning 10 of Maryland's Welcome Centers - check back for exact locations and more details.